The United Arab Emirates is abundant with online shopping, yet the biggest sites are only a handful, providing everything you need with competitive pricing. 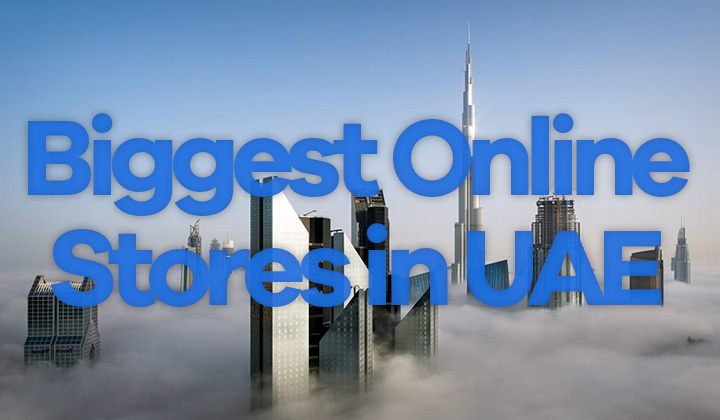 These are the largest, most popular online stores in UAE of 2019. The Burj Khalifa award for the biggest online shopping site goes to..! We can say for a fact that it’s currently the largest, most popular and the fastest growing English-Arabic language online superstore in the UAE. What makes them the biggest? More than 300 shopping categories under one store. It is the 9th most used website in the UAE with 8 million monthly visitors. It’s also a buyer/seller portal, where thousands of sellers from the UAE and Arabic world offer their products through the website. They were acquired by Amazon in 2017, offering a familiar shopping interface, Kindle books, full range of low-cost AmazonBasics goods. They have their own fashion store, and feature daily rotating deals. Also shopping apps, for iOS, and Android devices (iPhone, iPad, etc.) are available for convenient shopping access to UAE’s largest stock of products. If you are looking for an online store that is focused on a specific shopping category, and huge. These are your options. Something missing, leave a comment?! It is none other than Jumbo Electronics, which is the most famous, and oldest offline retailer of laptops, phones, gadgets, anything related to electronics. Besides carrying the largest stock of electronic items through their e-commerce website, thanks to service centers throughout the country in Abu Dhabi, Dubai, Sharjah and elsewhere. It’s easy to deal with warranties and support locally. You’ll find the largest selection of brands, and all authentic products. The leading fashion retailer is Namshi, with services throughout the Middle East. They have the largest stock of fashion products with hundreds of categories for women, men & kids. Also sports clothing and other beauty, home, lifestyle items. They also have an online outlet store for the cheapest offers in fashion. Their store features free shipping within 24h in the UAE, a growing portfolio of local and international fashion brands, 14-day returns as well as cash on delivery. All shopping brands are guaranteed 100% genuine. Started by two mothers, Mumzworld is the most popular shop for clothes and other goods for babies, children and mums in the UAE. They have the largest inventory with more than 200,000 products, and over 1600 brands, all authentic. As well as free, fast shipping with cash on delivery and a price match policy which guarantees the lowest price for all items. It’s the obvious shopping destination for all mums. And that concludes my list of the biggest online stores in the United Arab Emirates, for shopping in Dubai, Abu Dhabi, Sharjah, Al Ain, Ajman, Ras Al Khalmah, Fujairah, Umm al-Quwain and elsewhere in the Middle East. Thanks for reading. Questions on e-commerce market in the UAE? I’m happy to answer your inquiries. For your information there are occasional links that are affiliated with the websites they link to and may convert to monetary benefit for the author. Thank you for your much needed and kind support, David.